Do you want to increase trust with your fans and followers? Want to avoid making mistakes on social media? There are easy ways to avoid potential problems that could negatively affect your business and reputation online. In this article, you’ll discover six ways to present your business in the best light possible on social media. Discover six ways to protect the reputation of your business with social media. You might think something is funny, but will it be funny to your followers? Or is it outdated? Is there a chance it might offend someone? Incorporating humor in your posts can help engage your followers, but you need to know your audience and keep jokes relevant to your topic. If you’re not 100% sure, ask someone you trust for an honest opinion. 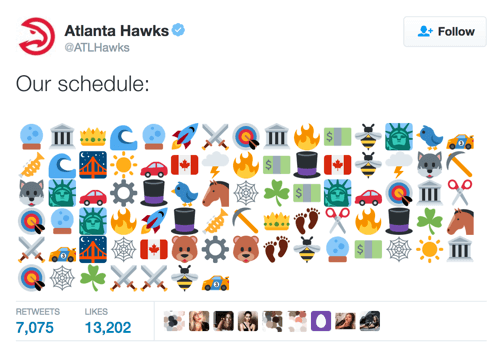 In this tweet, the Atlanta Hawks cleverly used emojis to represent the teams on their 2016 NBA schedule, knowing their fans would get the joke. When you incorporate humor in your own posts, try to be clever but not too esoteric, or you run the risk of your humor falling flat with your audience. The Atlanta Hawks found a humorous way to draw attention to the upcoming NBA season. Hiring full-time proofreaders isn’t feasible for most businesses. If you’re proofreading your own social posts, take the time to check your math, verify spelling, look up definitions, and do a little online sleuthing to confirm the validity of your claims. Don’t just rely on your gut feeling. 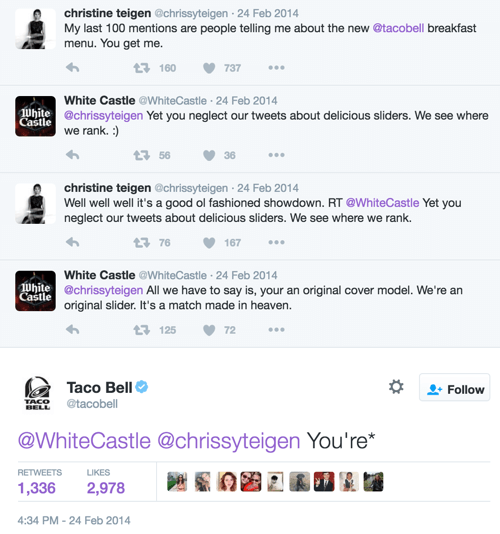 A quick proofread by White Castle would have kept a brilliant brand interaction with a celebrity from falling flat and giving Taco Bell a chance to bring the conversation back to them. Always check your posts for spelling and grammar. The holy grail of social media is engagement. Responding and participating in conversations with your customers and advocates help you build brand loyalty. If you don’t have time to respond on your social sites, you’re likely better off just closing down your accounts. A lack of response is worse than having no social profile at all. You need to know what your customers are saying and sharing so you can address potential issues before they grow into bigger ones. You might also potentially turn a negative experience into a positive one. If you see a social post about a potential problem with your business, send that person a message offering to continue the discussion offline to help rectify it. Trying to resolve matters in an online discussion might turn off other customers and lead to factual inaccuracies being broadcast to the public. Offer to resolve the customer’s problem offline. Offering to take the matter offline not only gives the customer a chance to discuss the issue in more detail, but also shows other users that your business cares about making things right. 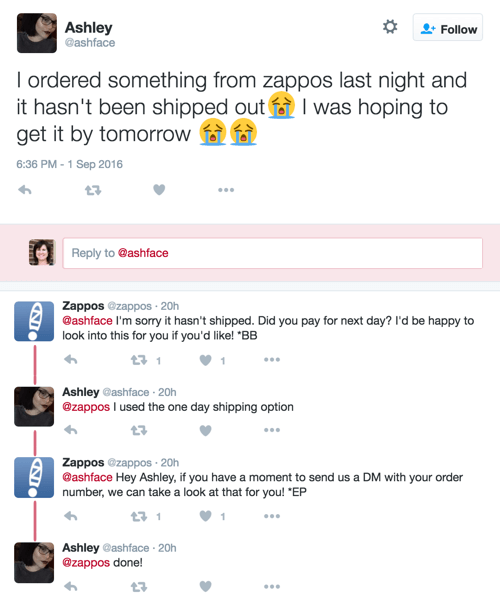 When customers take the time to share their thoughts on social media, it’s important that you acknowledge them. As quickly as possible, apologize for their experience without admitting being in the wrong. Even if getting a complaint doesn’t feel that great, you failed to meet your customer’s expectation. Embrace and learn from it. If you’re providing customer service through customized apps connected to your social media accounts, check the links frequently to make sure they’re working correctly. If they’re broken, turn them off and fix them quickly. Customers often go to Facebook to share frustrations, so having an app that makes it easy for them to call, chat, or email you will help you serve them while keeping negative comments off of your public page. If the app isn’t working, customers might start questioning your professionalism and the accuracy of the information you provide them. This error message from a Cloud application platform leaves a Mercedes-Benz fan disappointed. Make sure customized apps for your social accounts are working. There can be many reasons why your company’s social accounts might be duplicated, from deliberate hijackers to employees oblivious to the implications. Duplicate pages not only potentially damage your reputation, but also confuse search engines, which are forced to choose which version they feel is the best fit for the query. Regularly search each of your social media platforms for your company name. If you see a duplicate account, open it and make a note of whom you’re connected with. If you don’t know who created the account, use the online help centers to find remedies, which differ for each social platform. To avoid internal issues within your company, make sure your social media policy includes a stipulation that employees can’t create their own sites with your business name. The solution to these duplicate Twitter accounts might involve merging the two accounts and then doing some cleanup. Regularly check for duplicate accounts on each of your social platforms. Many businesses routinely respond to negative reviews, but don’t think about acknowledging positive ones. Show your appreciation to customers who take the time to share positive experiences with your product or service. It’s more than good manners; it’s good business. Engage with both happy and unhappy reviewers. Do take care in how you respond. Some of your customers may have unpredictable sensitivities. Acknowledge reviews as quickly as possible and be polite and professional. Using SEO keywords in your responses also may push your social site higher in search engine rankings. For example, you can turn your response into a billboard showing how much you love your customers and mention all of the great things you’re glad the customer liked. Before you send a tweet or post a status that you wish you could take back, be cognizant of how you’re communicating with customers and prospects.